The Carkeek Watershed Community Action Project (CWCAP) has developed an informative story map detailing Piper’s Creek in NW Seattle. The story map outlines the history of the land where Carkeek Park sits now, the ongoing challenges with wastewater, stormwater, and pollutants in the watershed, and how volunteers and City/County staff are monitoring salmon health and water quality. Piper’s Creek watershed is the third largest watershed in Seattle, with over 50% of the watershed covered by impervious surfaces. The Washington Recreation and Conservation Office (RCO) recently released the 2018 State of Salmon in Watersheds report that depicts Washington State’s efforts in salmon recovery. The report notes salmon still are in trouble, with only 3 of the 15 genetically distinct populations of salmon and steelhead nearing their recovery goals. The report highlights successes and challenges in recovering salmon and steelhead. The press release states that “In the past 10 years, regional recovery organizations received only a fraction—16 percent—of the $4.7 billion documented funding needed for critical salmon recovery projects.” The report is covered in the Seattle Times article After 20 years and $1 billion spent on Washington state salmon programs, fish still declining, new report says. Despite the recent attention and investments made to recover Puget Sound’s Southern Resident Orca population, two more members of the J and K pods are suffering from suspected malnutrition from a lack of salmon. In early January, the Seattle Times reported that J17, an important matriarch of the J pod, and mother of J35, or Tahlequa, who carried her dead calf for 17 days last summer, and K25, who lost his mother in 2017, are both likely ailing from a lack of sufficient food. The Lummi Nation hoped federal officials could launch an emergency response to help the two orcas, but due to the January government shutdown, approval and coordination of a launch could not take place. In their quest to identify causes contributing to the decline of Puget Sound Orcas, researchers are exploring whether the biennial cycle of pink salmon could have an effect on the orcas. Researchers noticed that significantly more whales have died in even-numbered years than in odd years from 1998-2017. 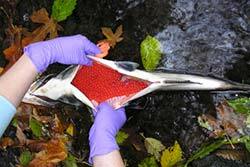 Pink salmon outnumber Chinook 50:1, and only return in odd-numbered years. 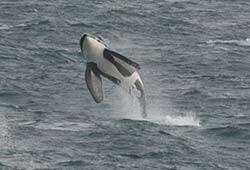 Orcas almost never eat pink salmon, and researchers hypothesize that the large number of pinks in odd-numbered years interfere with the echolocation orcas use to hunt Chinook, affecting mortality and reproduction rates the following year. WRIA 8 has developed legislative priorities to advance Puget Sound watershed health and salmon recovery, as well as orca recovery. WRIA 8’s 2019 state and federal legislative priorities can be found online. Native plants thrive in our local environmental conditions and require less maintenance and water. King Conservation District (KCD) offers a variety of native trees and shrubs for conservation purposes for purchase online with a pick up date of March 16, 2019 at Renton Community Center. The majority of the plants offered are bareroot stock which means they do not come in pots or burlap bags, but are harvested from the field in winter when the plants are dormant and ready to be replanted. Bareroot plants are affordable, hardy, have well-developed roots, and are easy to handle, transport, and plant. The WRIA 8 Technical Coordinator position offers an opportunity to work collaboratively with a unique and diverse community of local government partners and other stakeholders and support implementation of salmon recovery in the Lake Washington/Cedar/Sammamish Watershed (WRIA 8). This position is part of a staff team that is funded primarily through an Inter Local Agreement (ILA) among local governments, with the team providing the technical, policy, and planning support necessary to implement the WRIA 8 Chinook Salmon Conservation Plan (WRIA 8 Plan). The WRIA 8 Plan has a strong technical foundation and guides actions to be taken by local jurisdictions and other organizations to help recover salmon in the watershed. The Plan incorporates a monitoring and adaptive management component that helps track progress and identify if/when adjustments to implementation strategies are needed. More information can be found in the WRIA 8 job posting. The King County Water and Land Resources Division (WLRD) is hiring a Kokanee Conservation Coordinator (Project/Program Manager III). This position will be located in the Regional Partnerships Unit (RPU), part of the Rural and Regional Services Section of the Water and Land Resources, a division of the Department of Natural Resources and Parks (DNRP). The position will report to the RPU, WLRD Director and DNRP Director's Office. The Kokanee Recovery Manager will work across King County agencies and with jurisdictions and partners within the Sammamish/Lake Washington watershed to advance kokanee conservation efforts. The position builds on the successful collaborative and adaptive framework established in 2007 and will continue partnership efforts with all DNRPs other salmon recovery efforts, particularly Water Resource Inventory Area 8 (WRIA 8). More information can be found in the King County job posting. King County is seeking applications for King County Conservation Futures tax levy (CFT) funds. Conservation futures dollars can fund the purchase of open space lands such as natural areas, urban green spaces, passive parks, regional trails, farms, and forests. CFT project sites can be used for low-impact passive recreational activities. The County anticipates having more than $40 million in funding to award to projects, due to the availability of bond-backed funds in addition to annual collections. Applications are due on Wednesday, March 6th, 2019. The County Council will make final award decisions in late 2019. Please visit the CFT website for application, schedule, and other information. The Rose Foundation for Communities and the Environment is accepting proposals for the Spring 2019 Puget Sound Stewardship & Mitigation Fund. The Fund's goal is to mitigate past pollution runoff by supporting community-based efforts to protect or improve the water quality of Puget Sound. Applications are due March 15, 2019. Information on eligibility and the application process can be found on the Rose Foundation website. NOAA has modified the deadlines and review process for the Community-based Restoration Program Coastal and Marine Habitat Restoration Federal Funding Opportunity (FFO) in response to the lapse in appropriations. A pre-proposal is no longer mandatory to submit a full proposal and the full proposal deadline is April 16, 2019. This funding opportunity is to support habitat restoration projects that use an ecosystem-based approach to foster species recovery and increase populations under NOAA's jurisdiction, such as salmon and steelhead. More information can be found on the NOAA website. WaterWorks provides funding for projects that improve water quality in the service area for King County's regional wastewater system. Pre-applications are due on March 6, 2019. More information can be found on the King County WaterWorks website. Join King Conservation District (KCD) to help restore the buffer habitat along May Creek in Issaquah by planting native trees and shrubs to support clean water and healthy salmon on March 2, 2019 from 10:00 am to 2:00 pm. Fall Chinook, as well as coho, sockeye, and winter steelhead have all been reported to spawn and rear in this creek. Register on Eventbrite. Join King Conservation District (KCD) for a free workshop to learn about native plants and how to make the right decisions for your landscape on March 2, 2019 from 11:00 am to 12:30 pm. Register on Eventbrite. The biennial Salmon Recovery Conference, which hosts around 800 attendees, more than 200 presenters, and 50 exhibitors, will be held in Tacoma on April 8-9, 2019. Early registration extends through March 7, 2019. This year’s conference marks the 20th anniversary of the passage of the Salmon Recovery Act in Washington State, and the theme for this year’s conference—Facing the Future Together—reflects the need to look ahead to the work that remains to recover salmon in Washington. The second International Year of the Salmon Workshop on “Salmon Ocean Ecology in a Changing Climate” will be held in Portland, OR on May 18-20, 2019. Hosted by the North Pacific Anadromous Fish Commission, the workshop will bring together scientists, managers and other stakeholders to consider the current status and future of salmon and their habitats for the conservation of anadromous populations in a changing world. Registration opens in early March, 2019. Students from Edmonds-Woodway and Meadowdale high schools are helping restore local salmon populations by placing salmon eggs in instream incubators. The students are members of the Students Saving Salmon club. NOAA Scientists describe how the estuary around Otter Island in the Snohomish Delta provides ideal habitat for juvenile salmon, with forest structures providing shade and overhanging branches providing bugs and other nutrients into the water. Otter Island and other estuaries like it used to be common in Puget Sound, but as development has advanced, the habitat has declined. Tidal forests have decreased by more than 90% since the mid-to late-1800s. Restoration projects like the Smith Island project and tree plantings are helping restore and preserve existing estuaries, as scientists plan for future forests amidst sea level rise. Low returns of Kokanee to the tributaries of Lake Sammamish during the past few years have prompted King County to take actions to save the species. The County has implemented a captive breeding program and is collecting sperm and eggs to freeze and store. The County is also looking at releasing fish in the fall, to keep the Kokanee away from the lethally warm summer water temperatures. Lake Washington sockeye have also seen decreased spawning numbers, with only 3,500 spawning in 2018, the worst year on record due to a disease that scientists don’t understand yet. Both species are also affected by toxic chemicals, decreasing habitat due to seawalls and tree removal, and climatic effects. Chinook salmon (also known as king salmon) are listed as threatened under the Endangered Species Act. In WRIA 8, citizens, scientists, businesses, environmental and community organizations, and local, state and federal governments are cooperating on protection and restoration projects and have developed a science-based plan to conserve salmon today and for future generations. Funding for the salmon conservation plan is provided by 28 local governments in the watershed. For more information visit our website at www.govlink.org/watersheds/8/. If you would like to submit an item for inclusion in the next WRIA 8 e-newsletter, please email lwest@kingcounty.gov.